Full tools, code snipets and examples using VI scripting. 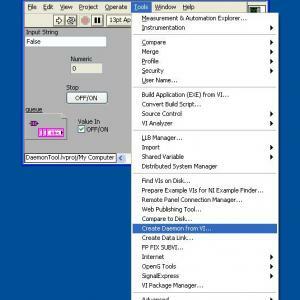 This Labview scripting tool takes a standard VI, and creates a wrapper around it to launch it as a daemon. This is useful for creating inline code modules that need a process to run in the background.Accessible through the tools menu option. Daemons will abort when the top level VI is aborted. Daemon can be aborted by closing the "Daemon Owner" VI refnum. Daemons obey source VI properties such as open front panel when called. Host process can be reentrant or standard. Tool places created daemon in idential project location. Tool will not alter the source VI in any way. To install this toolkit unzip and run the setup.vi file. The setup.vi as well as uninstall.vi will run immediately upon opening, so if you wish to inspect the files open the .lvproj file in the /source directory. It will install the toolkit to whatever version of labview runs the setup.vi file. uninstall.vi will uninstall the package. 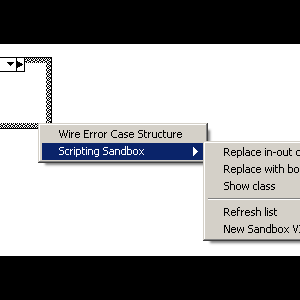 The package has been saved in LabVIEW 8.6, and fully tested in 8.6 & 2010.
search for the "Scripting Sandbox" support page. Put your real name here for the copyright to apply. ,invoke node, propriety node ,Global and control references. I develop this tool for limit few click and for fun. Copy Move Label.Vi and _Move Labelfolder in your labviewxx\project folder and restart labview. Actualy the diagram constante are not concern with label mouvement but i can upgrade if someone wanted. Like i have only Labview 7.0 ,they is certainly new object that can be concern but can't be implanted now. But if you look code, i think it's not very difficult. 1.0.1 Minor correction about front panel apparence. Now run with Global too. Now the Default position is Left. --see readme text for contact information. A simple example of how to create a new VI using scripting. The VI has a path control and a path indicator, which are connected using scripting. The path control is connected to the upper left connector on the 4x2x2x4 connector pane, and the path indicator is connected to the upper right connector. This VI is designed to help a newbie learn some of the basics of LabView scripting. Code was created and tested using LV 7.0. Code should work in other LabView versions, but has not been tested there. This VI uses scripting to create a new polymorphic VI that contains the methods for creating any type of numeric control on a VI's diagram. This VI is designed to help a newbie learn some of the basics of LabView scripting. As well as serve as a tool to make scripting easier to code. Code was created and tested using LV 7.1.1 Code should work in higher LabView versions, but has not been tested there. Added code to make polymorphic VI's icons match thier intended numeric type. Fixed a bug where an error 7 would occur because the polymorphic VI doesn't exist on the users machine to be deleted. 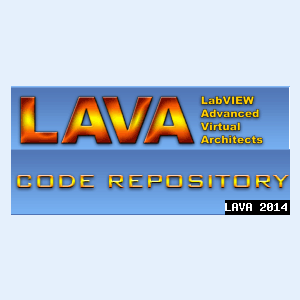 Re-release of code as LV 7.0 for more universal compatability. Changed code slightly to read empty polymorphic VI from disk, instead of using a constant on the diagram. This simple VI uses scripting to create a new VI that has two numeric controls and a numeric indicator. The two controls are multiplied together and wired to the indicatorThis VI is designed to help a newbie learn some of the basics of LabView scripting.Code was created and tested using LV 7.0. Code should work in higher LabView versions, but has not been tested there. Code was created and tested using LV 7.0. Code should work in higher LabView versions, but has not been tested there.